I had a plan, like I have many plans. The goals were set, the tactics and sections all decided upon. The blog posts were about to be written and motivation was high (despite it being January). Then the plan went wrong. The wheels fell off in the first bend. Well maybe two wheels at first. I continued to steer the plan precariously balanced on it’s remaining wheels, until those wheels fell off too. Here I am now, stationary. Goals still set but plan in tatters. What to do now? Make a new plan. By the end of 2016 I had changed a lot. My monthly challenges had shown me I was strong and capable. That little goals add up to big achievements. I needed some new goals. Especially as January threatened to pull me down. I needed motivation to keep going. The plan wasn’t complicated and the goals were achievable. I planned to run more with my monkeys, get them inspired and give them a base sport to hopefully always return to. I also planned to set some personal goals. Increase my speed, just a little, nothing crazy, and take on a couple of 10ks to make it all a little more challenging. It was going to be oh so simple. I undertook a 12 week 10k training plan. Interval work at 20 to 30 minute sessions. No longer than my usual time spent running. Different timed intervals some faster than my usual pace then slow. I was sensible, no hills to start with and not too fast. I loved it. After just a week I had my first 2017 5k trail race and I was ready to push myself a bit harder. I did it. I found a comfortable and faster pace and powered round the course shaving a good 2 minutes of my personal best. I was buzzing by the finish line. By the next day my left ankle was burning. I was sensible again and took a couple of days to rest. It was still niggling me by midweek so I gave it the full week. By Saturday it felt ok.
Time to put the second part of my plan into action with a 3k family run at a nearby rspb wildlife sanctuary. All went well despite us being the only family in attendance. Still feeling enthusiastic as the monkeys loved it. But the niggle in the ankle returned. Monkeys slept out that night so Mr LMR and I went for an easy 5k together on the Sunday morning. By the end of the run the niggle was burning again. By Monday I could hardly walk on it. On Tuesday I saw a physio privately hoping for a quick and easy fix. No chance. Badly sprained tendons in the arch of my foot. No running for at least four to six weeks. Disaster. It was a set back. A big one. I didn’t want to stop. I rested as best as I could for a week. Little Miss’ last two teeth and a string of the usual jobs that involve walking on your bad foot, all day long made resting a joke. I got grumpy. In fact Mr LMR told me so. A few times. I needed a new plan. The new plan involved me getting out my old bike. 20 years old in fact. I bought new lights, a helmet and a gel seat cover. I had been asked to try a duathlon this year so it seemed like a good move. As I wasn’t geared up for taking Little Miss on my bike it was going to be a bit harder to get out. But I was determined. Last weekend was going to be my first ride out. Just 20 minutes round the block. Then I got an eye infection. A great big swollen, watering, gunky eye infection. I just wanted to shout “WHY!? !” It felt like someone was testing me. Again and again and again. Picking away at my motivation and taking away the things that help me stay on top of the monster. I just wanted to give up. But then I thought again. It is funny how your body just keeps going if you push it. But when you stop it just gives in and lets the things you have been fighting take over. Within a week of not running I had a cold and then the eye infection. My body gave up and let it all in. The less I exercised the more exhausted I became. The lower my mood and my motivation just trickled away. It can’t go on like this so another plan is required. I may not have a working plan but I still have goals. First part of the plan is focus on those goals. The second part of the plan is get better. The physio treating my foot told me that injury is part of any sport, it doesn’t matter how careful you are. To get back to where you were takes time and gentle recovery. Then we laughed about how impossible it will be for me to rest. I can only focus on one day at a time. As I can’t even go for a walk I need to grab the times I can cycle when I can. If the chances don’t arise then I need to look after what I eat and drink to improve my mood. Also I can stand out in my garden and (hopefully) feel the sun on my face or grab a seretonin boosting cuddle from any one of my monkeys. I can do this. It is going to take time, but what choice do I have? I’ve written down my goals, they’re locked in. The plan I’m sure will continue to change and the hurdles will keep coming. But, I’ve got this because life without running is not the life for me. I need the pavement underfoot, fresh air in my lungs and the elements on my face. Whatever it takes, my head is dependant on it. ← What is normal anyway? Honest and true. 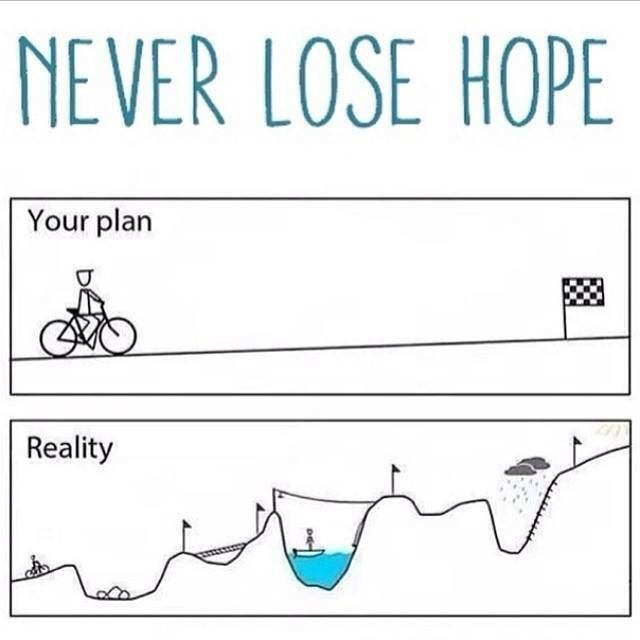 This is reality and why it’s so hard to keep motivated sometimes. Good for you keeping a level head and realising you are only human. Good luck and hang in there.